Having taken all the paint off the outer wing and bumper, I’m going to use these two parts as a test and take them through to completion before I start the rest of the car. This is to get my welding and spraying skills back in check, whilst keeping the job small enough that it doesn’t get too daunting. As I mentioned in the last post, the outer wing will need a new piece of metal fabricating and welding into the bottom section. Having looked at the area of the car where the panel touches, it is clear to see why it is so rusty! 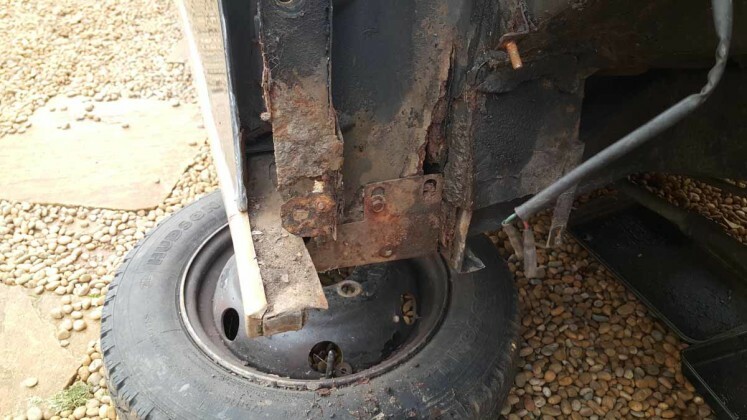 There should be a panel which prevents mud and silt spraying up from the wheel onto the bodywork behind, however the bottom half of this was completely missing when I was removing it from the car. I’ll most likely have to fabricate/purchase a new one when I eventually refit the wing. This creates the perfect environment for rust, which is why it has spread to the outer wing. Anyway, to the spraying – having removed existing paint, I am going to spray the panels with the Zinc 182 in order to inhibit the light rust which is still on the panels, whilst preventing any further rust. 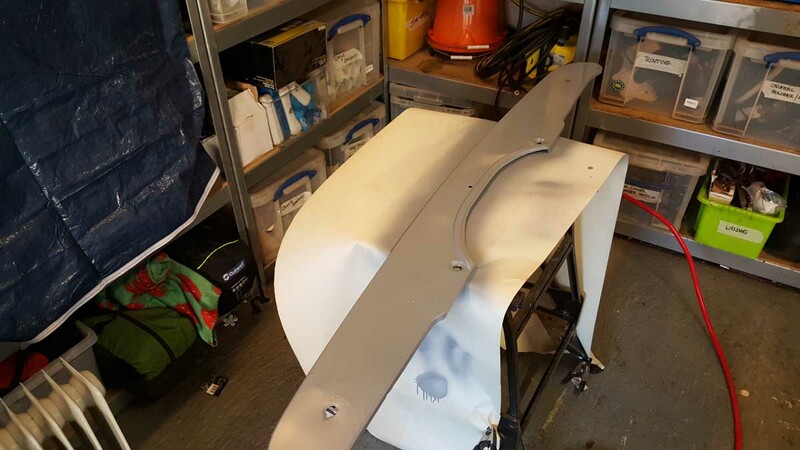 I sanded the bumper panel and outer wing down with 180 grit sandpaper (on a dual action polisher) and then degreased it so it was ready for painting. This is how the panels came out. The primer went on nicely, and having left the panels for a day, it has bonded to the metal very well, I can’t even scratch it off with a coin. 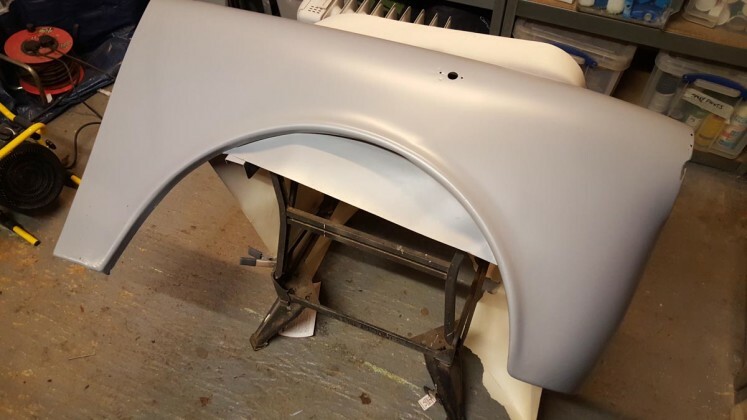 Now, it’s slightly unconventional to spray the primer before any of the bodywork, however the filler will now be going over the primer, so it maintains the rust inhibiting properties. 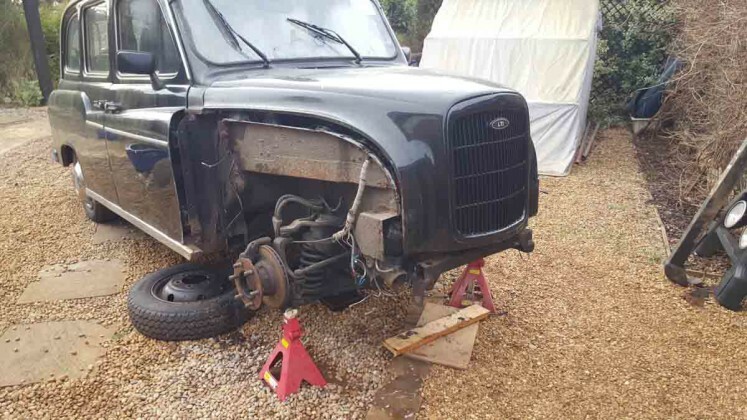 As I mentioned, the wing will need a new part welding on, however I sprayed it in the meantime so the bare metal doesn’t rust, whilst I work on the bumper. Check out the next post where I fill and sand the pitted parts of the bumper.